Provide your agents and policyholders with features that simplify their work and provide a positive experience. 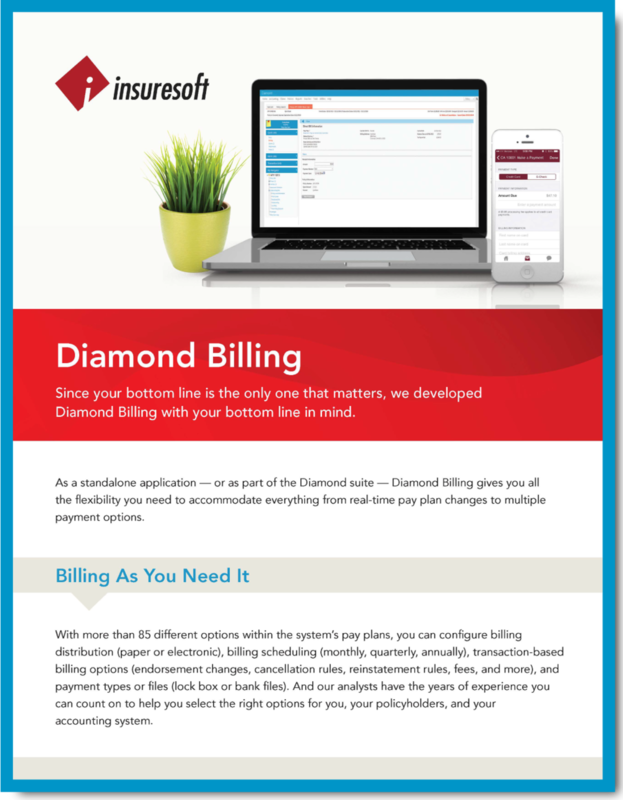 The Diamond Billing module offers flexible payment plans and options that are designed with both customer service and profitability in mind. As a standalone application, or as part of the Diamond Platform, Diamond Billing is a flexible solution that you can configure to meet your unique business rules. Unlimited payment plan options can be configured to support individual settings for the number of installments, the days between installments, minimum payment amounts and more. Flexible Fees and service charges and the ability to trigger them at different times. Our analysts have years of experience in dealing with the billing requirements in states and territories and can help select the right billing options for you, your policyholders, and your accounting system. Take advantage of a configurable design to satisfy your agents’ and policyholders’ distinct needs. Implement pay plans that work for your clients and allow them to make real-time pay plan changes mid-term to give them control of their payment options. Offer your agents and policyholders a wide variety of options for paying their bills, from mobile to web, credit card or EFT, checks, or cash. Accurate and easy-to-access information on the current amount due and future bills provides data your clients demand. Enable agents and policyholders to preview the billing impact before issuance when processing transactions. Insurers want to provide flexible options while still managing their bottom line. Policyholders want the ability to make payments anytime from anywhere. And, agents want real-time information at their fingertips. Allow Diamond Billing to deliver the capabilities that are right for every situation.